Coverage: Live text commentaries and reports on selected matches online and on the BBC Sport app. Hosts Chile began their quest for a maiden Copa America title with victory over Ecuador in Santiago. 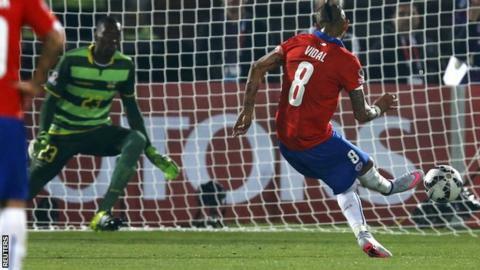 Midfielder Arturo Vidal was brought down in the box by Miller Bolanos in the second half and picked himself up to convert the penalty for Chile. Former QPR man Eduardo Vargas netted the second, calmly slotting home, as Matias Fernandez was sent off late on. Ecuador's best chance fell to West Ham striker Enner Valencia, who struck the crossbar with a close-range header. Chile have never won the competition in its 99-year history, coming runners-up on four occasions, the last being in 1987. And having reached the last-16 of the 2014 World Cup, the Chileans are third favourites behind Argentina and Brazil to lift the trophy this year. "Burnley fans can catch up on their one time goalkeeper Diego Penny of Peru, while Manchester City supporters need ask no more what became of Argentine striker Mathias Vuoso - he is representing Mexico at the Copa." The top two sides from the three groups will progress to the quarter-finals, as well as the two best third-placed teams, with these sides lining up alongside Mexico and Bolivia in Group A.
Chile showed more intent in the encounter with some sharp, crisp passing, while Juventus's Vidal and Arsenal forward Alexis Sanchez combined well in the final third. But they were unable to find a killer touch in front of goal early on as Sanchez stabbed an effort wide, while ex-QPR full-back Mauricio Isla came close as well. Ecuador, who failed to make it out of their group at last year's World Cup, were happy to sit back and use their pace on the counter-attack. Striker Fidel Martinez forced Barcelona goalkeeper Claudio Bravo into a full stretch save. The game's defining moment came from Vidal, who seemed to go down easily in the penalty area, but stepped up to score an unstoppable spot-kick into the top corner of the net. They got their second six minutes from time, punishing poor Ecuador defending, as Sanchez played in Vargas who struck a low finish. The match ended on a sour note for Chile after substitute Fernandez was dismissed for hacking down Juan Carlos Paredes in injury time. Match ends, Chile 2, Ecuador 0. Second Half ends, Chile 2, Ecuador 0. Second yellow card to Matías Fernández (Chile) for a bad foul. Foul by Matías Fernández (Chile). Substitution, Chile. David Pizarro replaces Charles Aránguiz. Goal! Chile 2, Ecuador 0. Eduardo Vargas (Chile) right footed shot from the centre of the box to the bottom right corner. Assisted by Alexis Sánchez. Enner Valencia (Ecuador) hits the bar with a header from the centre of the box. Assisted by Walter Ayoví following a set piece situation. Attempt blocked. Walter Ayoví (Ecuador) left footed shot from outside the box is blocked. Substitution, Ecuador. Renato Ibarra replaces Fidel Martínez. Attempt blocked. Miller Bolaños (Ecuador) right footed shot from the left side of the box is blocked. Assisted by Jefferson Montero. Corner, Ecuador. Conceded by Marcelo Díaz. Fidel Martínez (Ecuador) wins a free kick in the defensive half. Matías Fernández (Chile) is shown the yellow card. Matías Fernández (Chile) has gone down, but that's a dive. Attempt blocked. Matías Fernández (Chile) right footed shot from outside the box is blocked. Assisted by Alexis Sánchez. Attempt missed. Jefferson Montero (Ecuador) right footed shot from more than 35 yards misses to the right. Assisted by Pedro Quiñonez. Substitution, Ecuador. Pedro Quiñonez replaces Osbaldo Lastra. Substitution, Chile. Matías Fernández replaces Jorge Valdívia. Goal! Chile 1, Ecuador 0. Arturo Vidal (Chile) converts the penalty with a right footed shot to the top right corner. Penalty Chile. Arturo Vidal draws a foul in the penalty area. Penalty conceded by Miller Bolaños (Ecuador) after a foul in the penalty area. Attempt saved. Eduardo Vargas (Chile) right footed shot from the right side of the box is saved in the centre of the goal. Assisted by Alexis Sánchez. Offside, Ecuador. Miller Bolaños tries a through ball, but Fidel Martínez is caught offside.